Last week was one of the most stressful weeks I’ve had in a very long time. All thoughts of trying to stay calm went out of the window, and it ended up being a race to get to the end of the week in one piece. Nothing Really Bad happened, just what felt like a battering of events, deadlines and a couple of really late nights which when combined with the early mornings really knocked the stuffing out of me. My week finished at about 3.15 on Saturday afternoon. 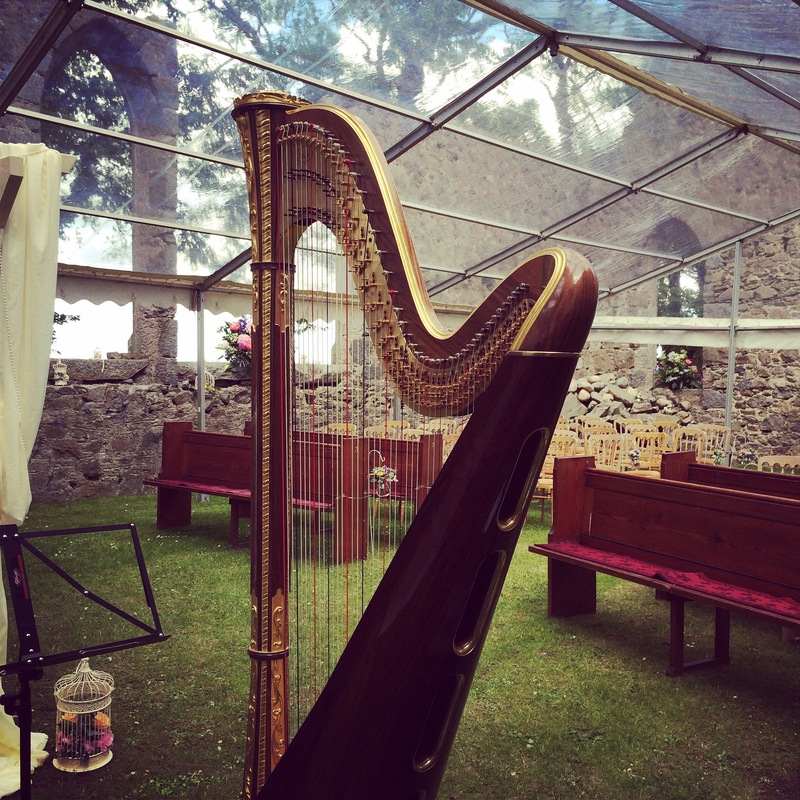 The wedding I’d played for had gone really well, and a ruined kirk on the north east coast of Scotland was filled with love and happiness as two people got married surrounded by their friends and family. My harp and all the associated clutter was all safely loaded into the car, I said my goodbyes and got back on the road for the long journey back south. Shortly after I pulled out of the village, I saw a sign. Time was tight if I was to be home for greyhound tea time, but I figured they would forgive me for being a few minutes late. I turned off the main road, tried not to bounce too hard around (and sometimes inevitably through) the numerous pot holes and parked up at the bottom of the dunes. I had no idea what the beach would be like, but I couldn’t resist exploring just a little. I got out of the car, rolled my jeans up and took my shoes off. The sand was wonderfully warm beneath my feet. 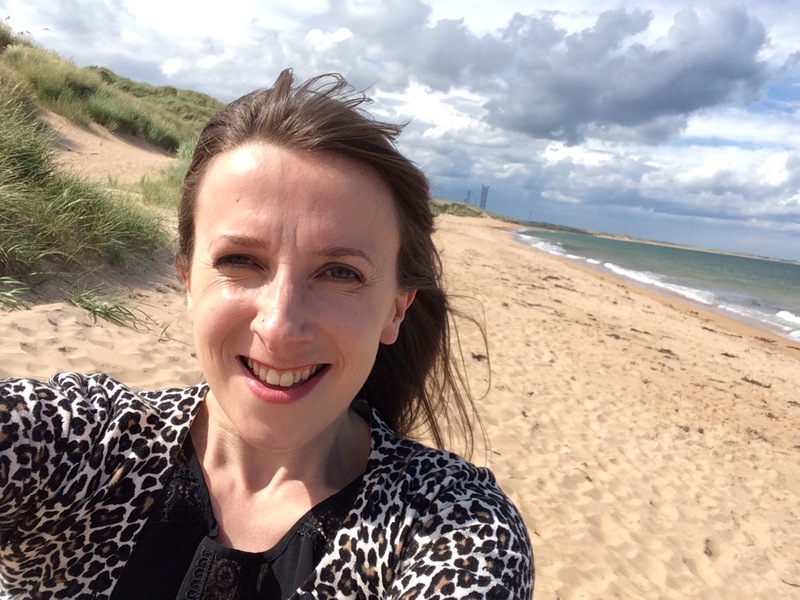 I ran up the dune, through the gap between the grass and down onto a gorgeous golden sandy beach. It was completely empty. The sun shone, and the only sound was the waves breaking gently. I skipped along the sand, and then wandered into the sea. It was cold, but it takes rather more than that to stop me getting my feet wet. I think I was there for about ten minutes. It wasn’t long enough, and yet it was. Everything lifted in those few minutes, and I didn’t have to try very hard to put on a big smile. I realised how much I relax when I am by the sea, and promised myself I would find a way to come more often. Lately I’ve been thinking a lot about where I might like to live on a longer term basis, and as I stood with the waves tickling my toes, I wondered if perhaps I could, or even should, factor in a nearby beach somehow. The previous Saturday I had my feet in the waves at Brodick Bay on the island of Arran off the south west coast of Scotland. This week it was the north east coast. Next Saturday, I’ll be in the mountains in Austria. No beaches there, but maybe I can find somewhere quiet in the hills to have a bit of a paddle, perhaps even a swim. In a month’s time I’ll be on the island of Tiree celebrating my birthday by running round the island one day then hitting the waves the next. It’s no coincidence that all the travelling is related to a break-up. Rather than waiting on someone else’s plans, I’ve jumped straight in and made my own and I feel all the better for it. This is more travelling than I’ve done for a long while, and I’d forgotten how much I love getting away seeing new places. The best thing about living where I do is that I don’t always have to go very far from home to find an adventure to have.